Chilopsis linearis Purple Splendor is a great small to medium tree for a dry garden. The Desert Willow gets to 15-20 feet tall and wide growing quickly to 10 feet and more slowly after. Chilopsis linearis Purple Splendor naturally grows more as a bush but can be trained as a tree if you start early and select just a few of the branches. Chilopsis linearis Purple Splendor has 1.5-2 inch pale pink and purple flowers with yellow markings. Desert Willow can take temperatures as low as 10 degrees. Chilopsis linearis will do poorly if given normal garden water. Irrigation should be limited as soon as the plants become established. The Desert Willow bloom Spring through Summer and will repeat if a significant rain comes out of season. Chilopsis linearis flowers and leaves are used medicinally as both a tea and as a wash or bath for bacterial and fungal diseases. The Spanish name for the Desert Willow is Mimbre, meaning willow-like. The Desert Willow is not a true willow but is in the Bignoniaceae with the Catalpa and the related Chilopsis cross Chitalpa Pink Dawn. Chilopsis linearis is native through the California Deserts into Mexico and as far east as Texas. 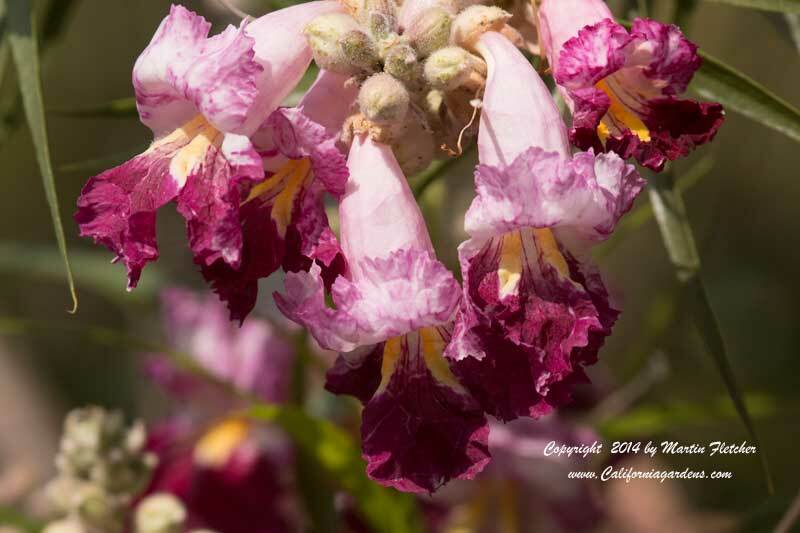 The Desert Willow can be found from 2000-5000 feet in washes and streamsides. With its substantial root system Chilopsis linearis Purple Splendor is a good plant choice for bank stabilization or just for a low maintenance colorful tree. Flowers and foliage of Chilopsis linearis Purple Splendor - Desert Willow. High resolution photos are part of our garden image collection.